I've had something similar that was good. Need to give this a try! Pinning it!! These were disgusting! If you leave them for more than a half hour, the batter gets soggy and un-chewable, really disappointing. My husband didn't touch them! I'd steam the cauliflower first so it's tender then coat and bake. I made this tonight with your blue cheesing dressing recipe and it was AWESOME! Totally satisfied my spicy buffalo craving but without that tired, heavy feeling I get after downing a plate of wings. Thanks!! These are amazing! Everytime I make them my hubby say how much he hates cauliflower and how good these are!! I use 1/2 cornmeal & 1/2 whole wheat flower. I toss them all in the batter bowl and stir. Then after the 20 minutes baking I toss them all in a bowl with the buffalo sauce and stir. Easy peasy!! Only problem is you cannot stop eating them!! 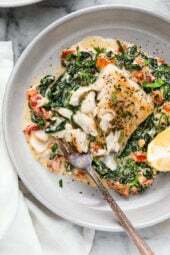 I made these using whole wheat flour and since my husband isnt a huge fan of spicy, I used less sauce- I used a basting brush to add the sauce, which also will help limit the sodium (my weakness)- I have made it twice in two weeks- such a good recipe!! I have never been keen on cauliflower. I made these last night and almost ate all of them myself. Still cannot believe how wonderful they tasted. Will be making them again before the week is out I am sure!!! I stumbled upon this recipe and made it for friends a couple of nights ago. It was a huge hit! Easy and quick to make, flavorful and fun to eat. I also made the low-fat blue cheese dressing to go with it, and added celery and carrots to the platter. Living across the river from this year's Super Bowl, it was a festive addition to a great evening. Oh man. I made these for the Pro Bowl last weekend, and they were fantastic. To make them gluten free, I subbed 1/2 cup GF flour and 1/2 cup GF breadcrumbs for the flour, and it worked beautifully. My meat- and gluten-eating boyfriend has been raving about them for days. Just tried to make these. Used Red Mill gluten free flour. The batter dripped off of the cauliflower onto the pan and we ended up with a big, gluey mess with cauliflower on top. Also, made the mistake of using the hot sauce we had on hand (Louisiana brand) and they were too too hot to even eat. Ended up throwing the whole thing away. Has anyone else had trouble with the batter? What did I do wrong? These look so good, but FAIL at our house. Have been meaning to make this for awhile now but just got to it tonight. WOW!! They were so good! I had it with a spinach fetta chicken pattie and some applesauce for dinner. Gina you hit it out of the park once again – thank you!! I made these today, replaced butter with e.v. olive oil, used a green habanero chile sauce and they looked like broccoli! I made these for the first time yesterday and love them. For those who thought they were mushy, I have a suggestion. I placed the dipped pieces on a cookie sheet and as I worked the excess batter dripped away. I then transferred them to a clean cookie sheet for baking. Great recipe, as for hot sauce, I found one that tastes just as good as frank's is less expensive and has much less sodium, only 135 mg. I have made these a bunch of times and love them! Re: lower sodium hot sauce, I really like Valentina Salsa Picante – it is a Mexican hot sauce (made in Mexico) that I find is a great trade off for Frank's. Valentina's has 64 mg of sodium to Frank's 190 mg, both for 1 tsp. I buy it in the Hispanic section of my local grocery store, Publix. I made these yesterday for watching football and they were AMAZING. 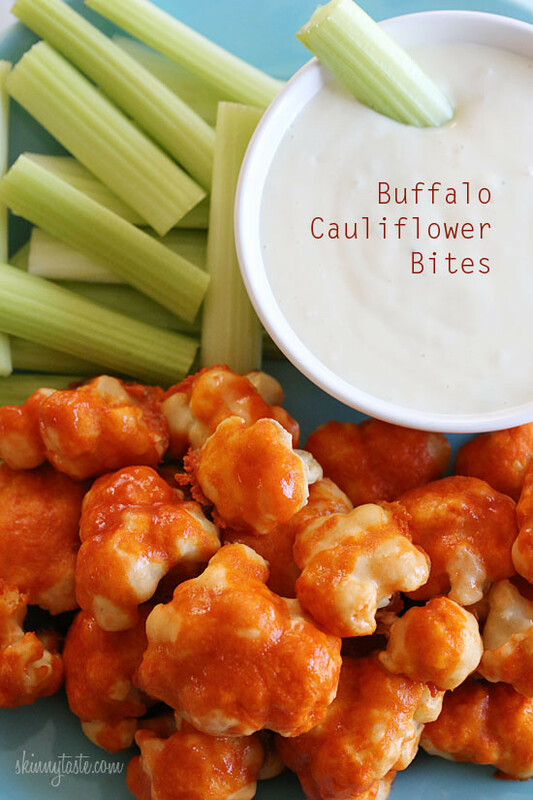 Even my husband liked them and commented how they had all the favor you want from buffalo wings but much easier to eat. Definitely making again. Thank you! I really enjoyed these! I made them late at night so my husband only had one, but he said they were pretty good (and he doesn't like cauliflower). Next time I'll cook them a little longer to get them a little crispier. Made this tonight and it was a big hit! We made them into wraps with lettace. The directions were perfect! Just made this tonight for dinner. Made it exactly according to recipe and did it as a salad with some homemade ranch, and lots of other veggies. It was a big hit. I did find that the breaded cauliflower stuck to the sheet even after spraying but that was my only problem. The taste was great! I had the same problem as some others – I followed the recipe exactly and they were yummy but the flour coating was a little mushy! They looked crispy when I took them out before adding the sauce (but I didn't taste or touch so I can't confirm), but after tossing in the buffalo sauce and cooking for 5 more minutes, they were a bit mushy. Still tasted good, but the texture wasn't great. Maybe next time I'll try cutting the florets smaller, I had some pretty sizable pieces. 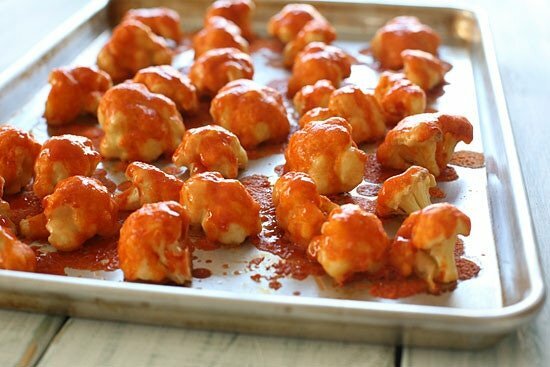 But I think these would be good with no coating at all, just roasted cauliflower with buffalo sauce! Then again, I love the taste of cauliflower so I'm not looking to mask it. Made these for lunch and they were very good even with using whole wheat flour. Next time I'll use milk instead of water (should help crisp up the breading) and will add onion powder and salt to the breading. I even gave them plain to my littles for lunch and they passed as chicken nuggets! One of my very favs. Made it again tonight. You need your own television show. Really. I'd watch you religiously. I made these tonight and the flour mixture ended up like a thick paste….was it because I used whole wheat flour? How do I get it less pasty?? These were great! Unfortunately for us, my mom used Frank's Hot Buffalo sauce instead of the regular hot sauce (we had it on hand), and not realizing it was WAY too hot for us, we of course poured it all over our cauliflower. We'll have to try it again with REGULAR hot sauce, haha. Just made these. I made only a small batch since I'm by myself, but I may have to go make some more. I used a buffalo ranch sauce from a local restaurant and had ranch dressing to use as a dip. I'm not a big fan of cauliflower, but these were fabulous! I want to try to make these to bring to a staff luncheon at work. Would they still taste the same if I make them the evening before and store them in the fridge? Has anyone tried that? I've made this a few times now. My family can't get enough, so I started making 2 heads of cauliflower at a time. I've been near-vegan for 6 years now and wings are one of the few things I greatly miss. I also took a batch to party full of meat lovers. Everyone LOVED this. Wings without guilt. simmer for 5 min and add more vinegar to make it taste more like a bottled hot sauce. I made these last night and they were absolutely fantastic! I used Baby Rays Buffalo Wing Sauce and regular butter because its what I had, but turned out amazing and was so quick and easy! I have shared this recipe with many at work so far today! Going to try the Chicken Taco Chili tonight! i used garbanzo bean flour instead of regular flour to make them gluten free.. they were fabulous! such a great sub for traditional buffalo wings! Hi- I'm the daughter of your daughter's teacher. I tried this recipe last night and it was great! It's really creative and a nice substitute for chicken wings for vegetarians. It was also relatively 'easy' to make. I did make the skinny blue cheese as well which was a great dip! Do these stay hot? Or do they still taste good after they've cooled? I want to make them for a party, but will need to travel after I've made them. I can not wait to try these. Every single recipe from your site has been a hit. My family sticks to Paleo, so I have been able to use your recipes as a base and just sub out Paleo friendly ingredients. Thank you for all the wonderful recipes. Made these for our Super Bowl party and they were a hit! Everyone loved them! Thanks so much for another delicious recipe!! I stumbled upon this recipe and it looked very promising and it did not disappoint! I actually became vegan after viewing PETA undercover videos. The only minor change I made to keep the dish vegan was to use a vegan buttery spread. After the first batch, I made a batch with broccoli; that was great, too! You know, I think I could have totally just seasoned the cauliflower without using the flour. I didn't feel like it added anything and whenever I can avoid using it, I'll try. Made these yesterday for Super Bowl Party and they were really, really good! Instead of 1 c. flour, I used 1/2c cornmeal and 1/2 cup flour to the water and then I mixed the hot sauce/butter combo into the batter. Delicious! 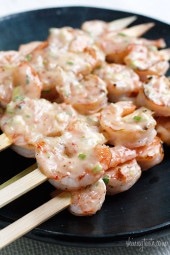 Thanks for such a great idea for a healthy appetizer! I made some with buffalo sauce and some with a teriyaki glaze. so yummy both ways! I just made this for the super bowl party and they are FANTASTIC! I used whole wheat flower and they cooked up beautifully. They were nice and crispy on the outside, and tender on the inside, like a good chicken wing. I saved a little of the sauce and poured it over the top after I took them out of the oven, and that finished them off perfectly. If you want them really crispy, just cut them into smaller pieces ( almost popcorn size, or a little bigger). My husband is super impressed. He's a huge wing fan, and NOT a cauliflower lover. GREAT RECIPE! For those who like lots of heat, Dave's Insanity Sauce made with Ghost Pepper ought to do the trick. I use Ghost Peppers on anything that can be made spicy. I just made these for a super bowl party this afternoon (also the low fat creamy blue cheese dressing) and they are AWESOME! I had to force myself to stop eating them now or there would not be any for later! Delicious! I am actually thinking might be able to get my kids to eat cauliflower this way, minus the spicy sauce. Maybe with a milder, sweeter sauce! Thanks for this! I used whole wheat flower and they came out perfect! Did you use Franks Wing Hot Sauce or regular Franks Red Hot?!! Hi-Should they be crispy? I made this exactly as written, using fresh cauliflower. They were nice and crispy after the first baking–until I put on the sauce. Then they became soft, and kind of mushy. Should they be crisp? I didn't want to cook them anymore, since the cauliflower would only get softer. Love all your recipes !!! This was my problem as well. They were nice and crispy after the first baking and now they're completely mushy and unappetizing. Not sure what the second baking is supposed to do? But it ruined my attempt. Bummer. This sounds like a dish my husband would enjoy and be able to get his buffalo fix.He can't eat the wing any longer he has developed an allergy to chicken.This way he can get the flavor of the wings without the allergic reaction,and they are health too. I made these the other day. They were fantastic! I put it on broil for the last five minutes to make them crispier. I will be making them again soon!!! OMG these are the best.My new things. this is amazing. I made them for my son's bday party and just again tonight for a snack. I'm thinking coated with a little nutritional yeast instead of flour would be amazing!! I am definitely making this recipe this week. Question, is this an eat right out of the oven thing or could it sit for a bit? I only ask because I have a work party I was considering bringing this to but I'm afraid it won't hold up. I made these the other night and they were fantastic! I served them with ranch dip made with greek yogurt. Your website has been a great help these days. I have been overweight as long as I can remember and it's a lot easier to loose weight when you have such great recipes to fall back on. Thank you thank you thank you! Really want to try this, sounds so good but I do have one question. Could you use whole wheat flour instead of the white? I am cutting out white flour in my diet. Or is there another option? I saw one person say there were going to roast the cauliflower without the batter coating and add the sauce. I wondered how that turned out. Just wondering how you think this may hold up for a lunchbox snack the next day?! Either way, I think I might make this dinner tonight! These are currently in my oven cooking with the sauce on them! Read the recipe days ago and was so stoked to buy cauliflower (who EVER says they are EXCITED to buy cauliflower!?) and make them:). ALSO, I just found this website and it's wonderful. So thank you to whomever has put in so much time and hard work – it's definitely appreciated. Finally got around to making these. They're WONDERFUL! They totally satisfied the craving for buffalo wings. I didn't miss the chicken at all (and I LOVE chicken). I didn't make my own dressing, but it was lovely with some Lite Ken's Steakhouse Blue Cheese. Even hubby liked it, and he is not a wing fan. He requested I make it again and try teriyaki instead of buffalo sauce. We'll see how that goes. I also want to thank Bob Thomas for his Wing Time sauce recommendation. The Mild was just the right level of spice, and gotta love that the sauce is low-sodium and no artificial preservatives! Is the batter supposed to be super thick? Mine was almost unmanageable, made a huge mess trying to get it on the cauliflower, and the cauliflower ended up looking like dough blobs, whereas yours, Gina, still looks like nice cauliflower. Is there some secret trick to coating the cauliflower? I tried this recipe and loved it although I found the cauliflower a bit soft.What changes should I make to have them more crispy? 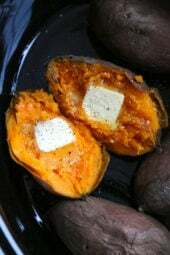 sounds DELICIOUS…havent done any research… but… I use Cornstarch and seasonings to coat my zucchini, sweet potatos, etc…to give it that "battered" feel…wonder if it would be better than flour>??? I am going to try these…YUM!!!! How did the cornstarch turn out? I used Texas Pete Hot Sauce — it has about half the sodium of Frank's. I'm not sure about these. I tried them for lunch today and I could definitely still taste the cauliflower. 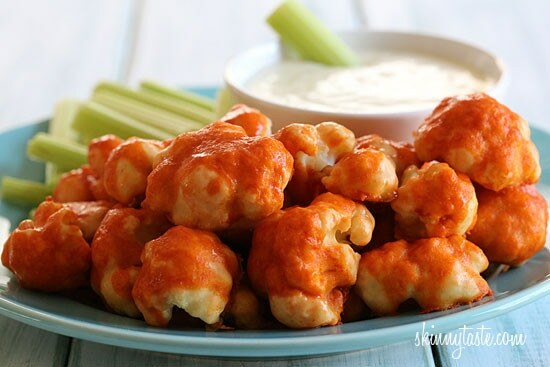 I HATE cauliflower…if you like it, I would recommend these. I think for me it was just too far from the "original" taste (of actual buffalo chicken) to be a good alternative. I made these tonight and I nearly didn't let anyone else have any! They are absolutely delicious! I don't like a lot of hot (just a hint of a kick is good for me), so I only used about 2 Tbs of Texas Pete hot sauce. It was perfect! I'm gonna have to go buy more cauliflower now! Thank you, thank you, thank you! OMG…these are so delicious, and I don't even miss the chicken wings aspect of this dish! Can't wait to share this webpage with some friends. Thank you for sharing it. I just had to tell you.. my husband HATES cauliflower, but I served this to him anyway, because he loves anything "buffalo" and he LOVED it. He ate it three times leftover! Definitely a great recipe! These were SO SO yummy! Thank you! I did some for the kids with no hot sauce, just Parmesan and butter. I might add a sprinkling of bread crumbs for crunch but still loved these. I liked these but my only complaint is there was no crunch or crispiness to them. Any tips on how to get that? Hi, this looks amazing but im doing the low carb diet. Wondering what i can do instead of the flour???? Please help would love to try this recipe. Made this last night and it was very good. Maybe a bit softer than I would prefer– next time I'll see if I can get away with a shorter baking time. Rather than drizzle the hot sauce mixture I tossed it with the baked cauliflower in a bowl before returning it to the baking sheet. That way every piece is completely coated and you lose less hot sauce! Made this last night. It was awesome. I drizzled a tbsp of lite blue cheese dressing on my portion… that made it amazing!. Another keeper. Thanks Gina, your recipes make me better cook. Tried it tonight and it was delicious! Rachael Ray did something similar, but she roasted the cauliflower in the oven with olive oil, no batter. I think I will try it both ways and judge for myself, but the one without the batter would definitely be healthier. Gina- about 99% of meals I make are from your website. I have been following you since 2008 when you first started and I have to say that might be my favorite recipe for far! My husband and I LOVE anything buffalo. I always joke that I could be a vegetarian if it wasnt for buffalo chicken but with this recipe- I could totally be a vegetarian now! One question for you- How would you reheat this? I feel like they could get a little soggy in the microwave. Mine have a wonderful crisp to them and dont want to loose that if i microwave them. Thanks! Gina- try Cholula Hot Sauce some time. It has 85 mg sodium per teaspoon as opposed to Frank's which has 190 mg per teaspoon. My family loves it and we used to be die hard Frank's fans! thank you Gina, I did not expect this to taste so good! This is a great snack and so filling. I made the bleu cheese dressing too… great together. I'll be making this weekly. It's so good you feel like you're eating something bad. Hi does the cauliflower come out soft or crunchy after it's baked? Hi – Can't wait to try this recipe. I am wondering if anyone has tried this recipe using fresh mushrooms… and instead of using hot sauce, just dipping them into a nice ranch or blue cheese dressing. I might have to try this. I've always loved the deep fried mushrooms, but not the fat. Thanks for a great recipe! To the person above – do not cook the cauliflower first. Just finished making these. I generally do NOT like cauliflower. But I do LOVE Frank's Hot Sauce. Still, I had very low expectations for these. I REALLY do NOT like cauliflower. But my love of Frank's won out. YUM! I skipped the butter. I'm guessing it would have helped in browning a bit, but I didn't miss the butter. I also added a teaspoon of seasoned salt to the batter. I had a small amount of batter left over after coating and baking the cauliflower, so instead of pouring the Frank's on them directly, I mixed the Franks with the batter, re-coated all of them to get a more even coating, and put them back in the oven for about 10 minutes. Turned out great! My son loved them without sauce on them. Definitely will make again. These were amazing! I can't stop eating them!